High Goals. Tutima. Partner of the German Aero Club. 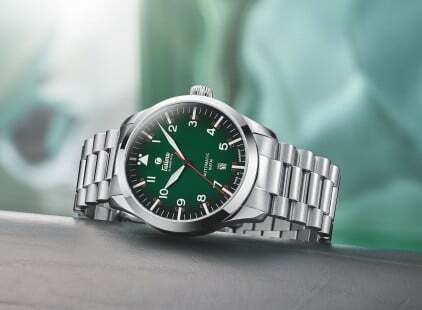 | Tutima Glashütte/Sa. High Goals. Tutima. Partner of the German Aero Club. - Tutima Glashütte/Sa. Start Sponsorships & Activities High Goals. Tutima. Partner of the German Aero Club. The experience of moving in the third dimension inspires human beings today just as it did at the beginning of aviation. The dream of flying remains; the prerequisites, however, have very much changed over the course of time. As the main sponsor of the German national motorized flight team in the German Aero Club (DAeC) and global partner of aviation, Tutima is committed to raising the level of safety and perfecting aviation competence. There are more than 2,000 associations with a total of about 100,000 members organized in the DAeC, the governing body of aviation sports in Germany. The best and most talented pilots taking part in national and international competitions receive optimal training opportunities thanks to Tutima’s funding. At dizzying heights, it is team spirit, reciprocal encouragement toward peak performance, and strength of nerves that count. Even celebrating successes at the highest levels is part of that: in cooperation with the German Aero Club, the Tutima Award of the Skies was endowed for the first time in 2009, with Germany’s top pilots competing against each other in the three disciplines navigational flight, helicopter flight, and aerobatic flight. Year after year, the audience is treated to maximal navigational precision and breathtaking aviation skills in a top-level performance. Because aviation is a risky sport, a reliable chronograph belongs to the equipment of any responsible pilot. Tutima will continue to contribute to making the passion of aviation come alive and measureable even in the future.